Last week I started to familiarize myself with the ESRI ArcGIS iPhone API public beta and I blogged about my First Impressions. This week I had a chance to play around with it some more and I decided to investigate working with location. 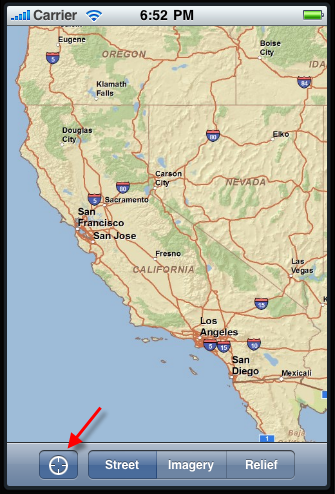 I enhanced my sample application from last week to include a Location button, which when pressed zooms the map to the current location and displays a custom push pin graphic. Click here to download the source code from this article. ESRI’s AGSGPS class provides a convenient wrapper around Core Location if you don’t want (or need) to delve into the details of the framework. The class definitely simplifies working with Core Location, but the trade off is that you are somewhat limited in what you can do. For example, Core Location includes the CLLocationManagerDelegate protocol which is “used to receive location and heading updates” so you can respond to them in your code. I’d like to see something similar in the ESRI iPhone SDK to give us more flexibility to respond to location updates. 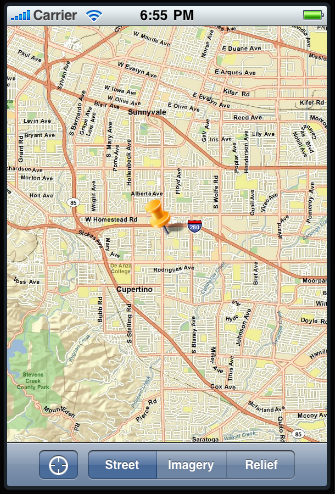 With the ESRI iPhone SDK, you just turn on the GPS and let the map do it’s thing. For my sample app, I decided to work with the Core Location framework for finer grained control over the user interaction. Finding the proper icon for the Location button was a bit tricky. Interface Builder doesn’t give you a way to specify this particular system icon for your button. I had to follow Diallo’s advice from this Stack Overflow question to get the icon from the UI Kit and save it to disk. 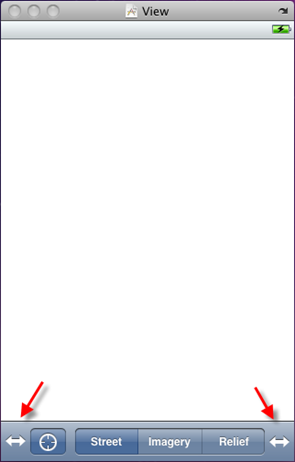 I temporarily added this code to the viewDidLoad event, and ran the application once to write the icon out to my document directory. If your not sure where the file gets saved, you can add an NSLog call to output imagePath to the Console. After the icon was saved, I removed the temporary code and copied the icon into the project directory, under the Resources group. I also cleaned up the previous week’s code a bit, to remove unnecessary AGSTiledMapServiceLayer members and properties. This code follows the same basic pattern shown in one of the examples in Head First iPhone Development . In this post we looked at some options for utilizing Core Location with the ESRI ArcGIS iPhone API. ESRI’s AGSGPS class provides an easy to use convenience wrapper around Core Location, but it is not as flexible as working directly with Apple’s Core Location framework. 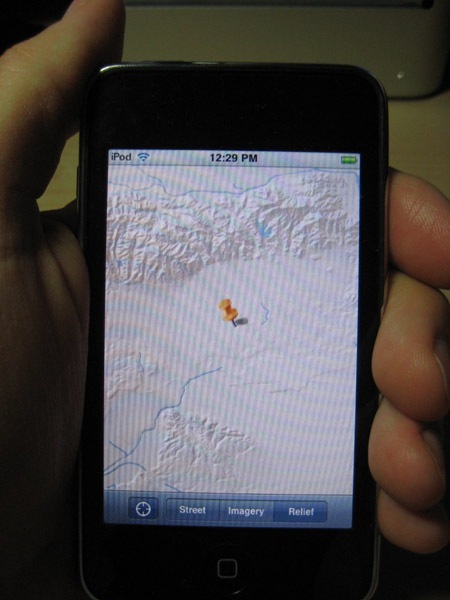 An example was presented that demonstrates how to work with the Core Location framework and ESRI’s iPhone API. The example showed how to get the current location and zoom to it while showing a custom graphic on the map. I hope you are enjoying these posts and finding the information helpful. If you have any suggestions, ideas or feedback, please leave them in the comments below.